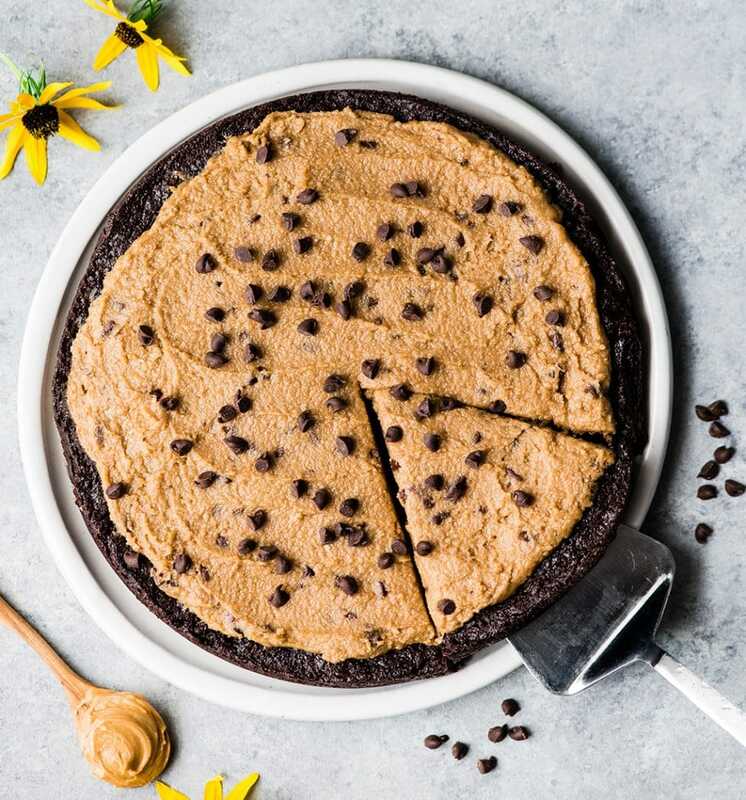 This Easy Fudge Brownie Cake Recipe with Peanut Butter Cookie Dough Frosting is irresistibly delicious! It’s gluten-free and easily made dairy-free! Today I turn another year older. And to be totally honest, getting older kind of freaks me out. Ok not kind of…it really freaks me out! I just love this stage of life so much…having babies, snuggling with my kids all day, etc. etc. that I am totally not looking forward to this season coming to an end. Thankfully I’m still in my early 30s (33 to be exact), and we have a long way to go before our kids get too old for snuggles. So for now I’m going to continue to embrace every moment we have in this stage of life…and celebrate the process of becoming another year wiser (hopefully), with this Fudge Brownie Cake Recipe! Because I decided that I would make all of you the same dessert I’d want someone to make for me on my birthday! And this isn’t any brownie cake. 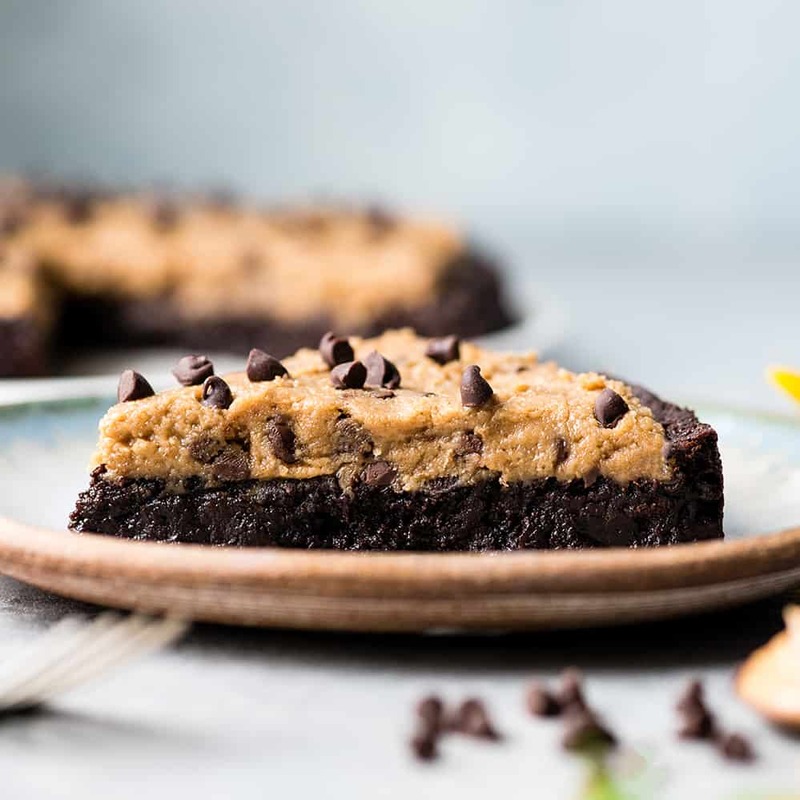 It is a flourless brownie cake with peanut butter cookie dough frosting. Yep. I said it. Yes I did it. No I’m not sorry about it. And OK, I guess I’ll share. How do you make a brownie cake? All right folks, this brownie cake recipe is really simple to make, just a couple bowls and some mixing (no standing mixer required). But I’m going to walk you through some of the steps to ensure your brownie cake turns out perfectly! In the microwave. This is my preferred method because it’s easy. Simply put the butter and chocolate in a microwave safe bowl (like this batter bowl…which I use 100x/day and couldn’t live without), and microwave for 60 seconds. Stir, and if everything isn’t melted, return to the microwave for 30 second increments (stirring after each one) until the mixture is smooth. On the stovetop. You could use a 4 or 6-quart pan and melt the butter and chocolate over low heat stirring occasionally until the mixture is smooth. Then mix the rest of the brownie batter in the pan! Sift the cocoa powder. This is optional, but recommended. Especially if your cocoa powder is especially lumpy. You do not want any chunks of unmixed cocoa powder in the batter, so I recommend sifting it to ensure that doesn’t happen! How to line the cake pan for easy removal. First, trace the bottom of the cake pan onto the center of a piece of parchment paper. Draw “handles” on two opposite sides of the tracing, so the paper would have marks on it like this =o= (LOL). Cut out the shape you just drew and place it in the bottom of the cake pan. Grease the bottom and sides of the pan and then add the batter in. This way, once the brownie cake has cooled a little bit in the pan, you can use the handles to easily lift it out and remove it from the cake pan without breaking it! Once you have prepared the cake pan and filled it with your delicious brownie cake batter, it’s time to bake. I always use a convection oven and place the cake pan on the center rack when baking. Please note that your oven could bake at a different temperature and time, so check the brownie cake for doneness starting at 18 minutes! How do you know when brownies are ready? You know that this fudge brownie cake recipe is done when the top is set and a toothpick or cake tester inserted in the center comes out with a few wet crumbs (not streaks of batter). Be careful because sometimes the toothpick (Or cake tester, which I have and use all the time) can stick into a chocolate chip and you might think the brownie cake isn’t done, when it really is! Cool in the pan first, then transfer to a cooling rack. 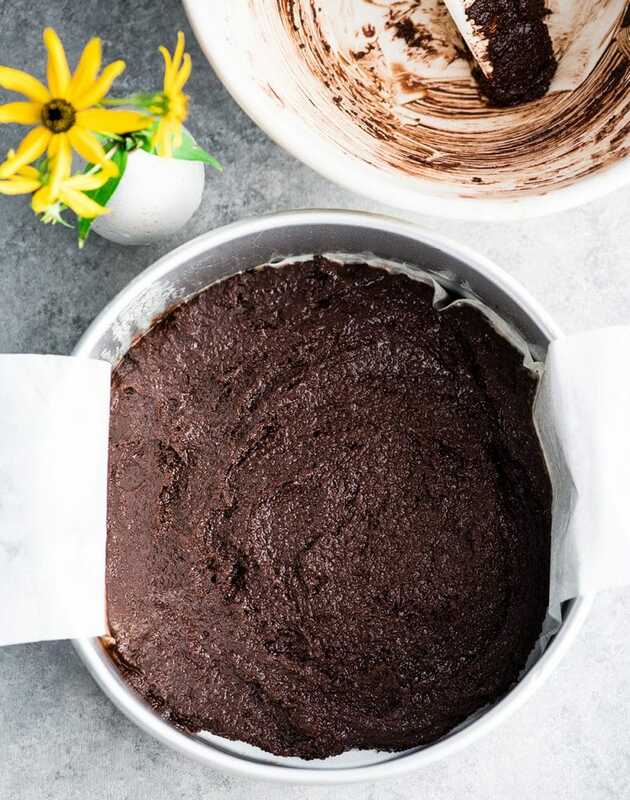 Since this brownie cake is irresistibly fudgy, it’s important to let the cake cool and set a bit in the pan before transferring it to the cooling rack. I recommend 5-10 minutes! I also recommend transferring it to a cooling rack that has a grid with very small spaces in between (like this one). This way the cake will hold it’s shape and not fall through the cracks! This is another one bowl recipe that’s super easy to make! The only thing that could add a step is if you need to make your own oat flour. Simply place old-fashioned oats in the container of your Vitamix (or another high-powered blender) and blend for 30 seconds. Then presto, you have oat flour! It’s so easy that I usually make it fresh whenever I need it, however another option is to blend a large batch of it and save it for everyday use. The ratio of old fashioned oats to oat flour is 1:1, so this recipe calls for 1/2 cup old-fashioned oats, which would mean you would need to use 1/2 cup oat flour. If using peanut butter and coconut oil varieties that are solid at room temperature, you will need to gently warm them until they are smooth and easily stirred together. Again this can be done in the microwave or on the stovetop over low heat. 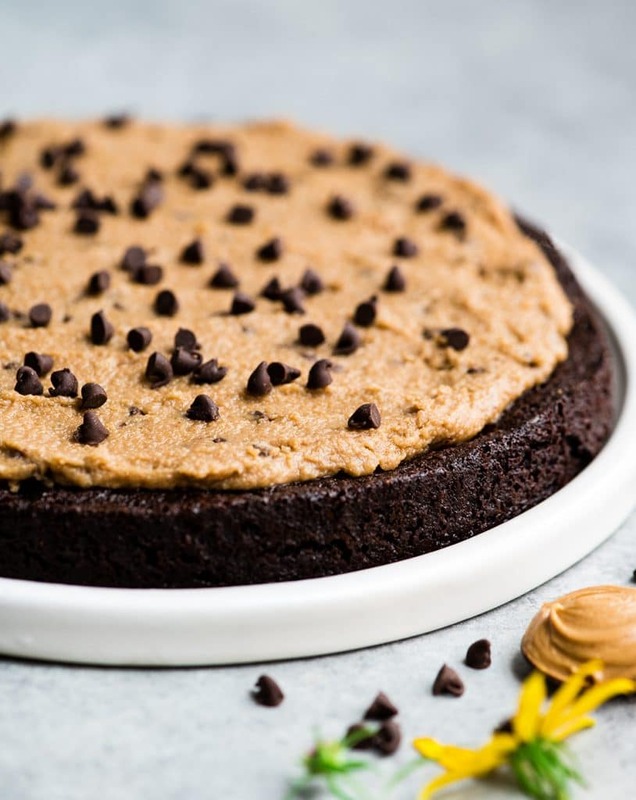 Once the brownie cake is cooled to room temperature, spread the peanut butter cookie dough frosting on top. If desired, sprinkle with some extra mini chocolate chips or drizzle with some melted chocolate. This fudge brownie cake is so rich I think it’s safe to say that one recipe makes 10 servings. I recommend slicing the cake and serving with a warm cup of coffee or a scoop of ice cream! What’s the difference between a cake and a brownie? Let’s address this important question. Because I adore brownies, but I don’t love cake. I can easily turn down a piece of cake (and do regularly) but a “brownie cake” is another story. Hence why I made this “brownie cake” for you (and me). Leavening agents. Cakes contain leavening agents which give them a light and airy texture. Fudge brownies do not have leavening agents (like this brownie cake recipe). Cocoa powder vs. melted chocolate. Most chocolate cakes only call for cocoa powder for the chocolate taste. While brownies usually contain melted chocolate. Fat content. Most chocolate cake recipes call for other liquids in addition to butter or oil (sour cream, milk, etc. etc.). So in general, brownies have a higher fat content than chocolate cake! What makes brownies cakey or fudgy? This question has a similar answer to the one above. A cakey brownie usually has leavening agents and a higher flour : fat ratio. Fudgy brownies (like this fudge brownie cake) have a higher ratio of fat : flour (or dry ingredients) and no leavening agents. Let’s take a moment and chat about the ingredients in this brownie cake recipe, and the possible substitutions! Butter. 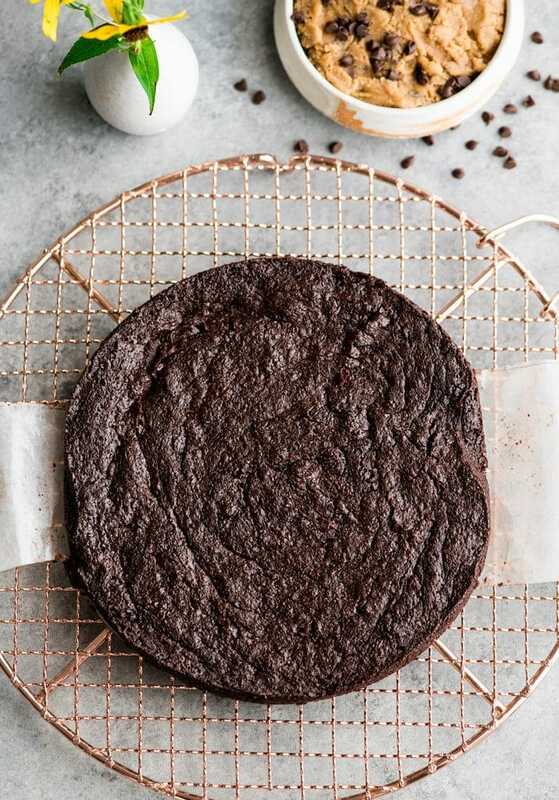 This brownie cake can be made with butter or coconut oil for a dairy-free version. I have made it both ways but I enjoy the flavor of butter the best! Chocolate Chips (for melting into the batter). To keep this recipe refined-sugar free, use unsweetened chocolate instead of chocolate chips. However you may need to increase the amount of coconut sugar to compensate. Eggs. I do not recommend making and egg substitutes in this brownie cake recipe. They are a vital part of the outcome! Coconut Sugar. Any granulated sugar works well in this recipe. I usually use coconut sugar or organic cane sugar. Corn Starch. Tapioca starch and arrowroot starch also work perfectly in this recipe! Old-fashioned oats: If you don’t prefer oats/oat flour, all-purpose flour or gluten-free all purpose flour can be used instead. Creamy peanut butter. Choose your favorite variety! Other nut butters work, but you may need to play with the amount to get it to turn out just right! Coconut oil. Butter can be used in place of coconut oil if desired! Coconut Sugar. Any granulated sugar works well in this recipe! Honey. Maple syrup or any other liquid sweetener can be used in place of honey, but in my opinion honey gives the most cookie dough-like taste! Milk. Literally any milk works in this recipe, dairy or dairy-free! Shop Brownie Cake Making Essentials! 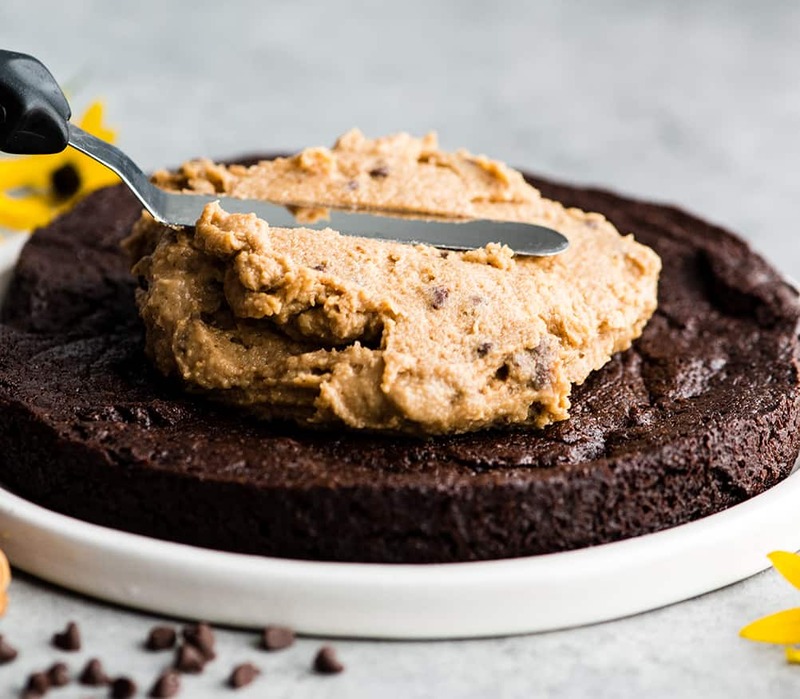 This Easy Fudge Brownie Cake Recipe with Peanut Butter Cookie Dough Frosting is basically the dessert of your dreams. A fudgy brownie cake is topped with a delicious peanut butter frosting that tastes like cookie dough. Plus it is gluten-free and easily made dairy-free! Line an 8” round cake pan with parchment paper and grease. Set aside. In a small bowl, stir together sifted cocoa powder, cornstarch and salt. Set aside. 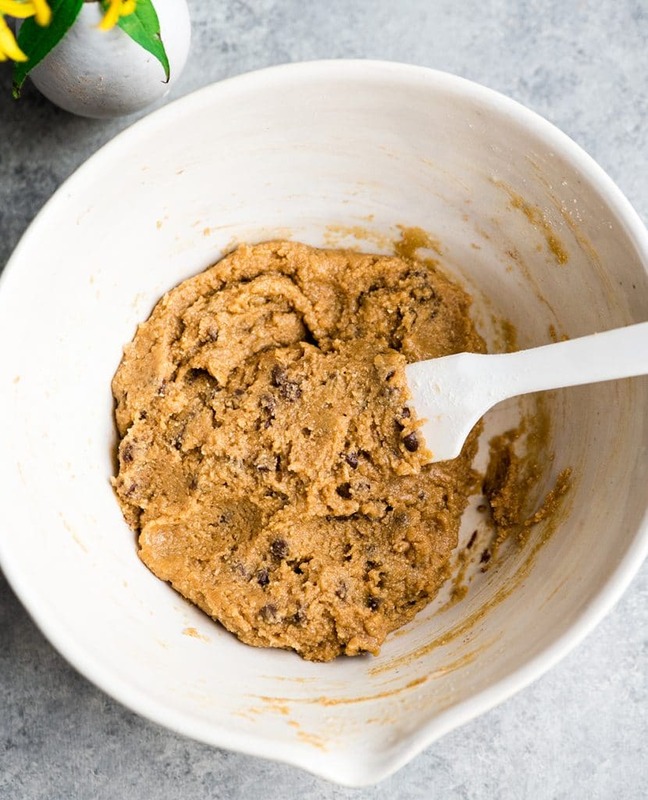 In a microwave safe container or on the stovetop over medium-low heat, melt butter (or coconut oil) and chocolate chips together and stir until smooth. Add sugar and vanilla to the butter/chocolate mixture and stir to combine. Add eggs and stir until smooth. Add dry mixture and stir until smooth and there are no lumps. Add ½ cup chocolate chips and stir until they’re evenly distributed. Bake in the preheated oven for 18-25 minutes, or until the top is set and a toothpick inserted in the center comes out with wet crumbs! Let cool in the cake pan for about 10 minutes. Then transfer the cake to a wire cooling rack to cool completely. Put old-fashioned oats in the container of your Vitamix or another high powered blender. Put the lid on and blend, starting on low speed and increasing to high, for 30 seconds, or until the oats reach the consistency of flour. Transfer the oat flour from the Vitamix container into a small bowl. (Alternately, skip these two steps and use an equal amount of oat flour). Add sea salt and baking soda and stir to combine. Set aside. In a medium-sized, microwave safe bowl, melt together peanut butter and coconut oil in the microwave or on the stovetop over low heat, stir until smooth. Add coconut sugar, honey and vanilla and stir to combine. Add the dry ingredients and stir until the mixture is homogenous (uniform throughout). Add milk, 1 TBS at a time, until you reach the desired consistency. Add mini chocolate chips and stir them by hand into the peanut butter cookie dough frosting. Once the brownie cake is cooled, transfer to a serving dish and remove parchment paper. Spread the top evenly with the peanut butter cookie dough frosting. Sprinkle with chocolate chips or drizzle with melted chocolate if desired for appearances! 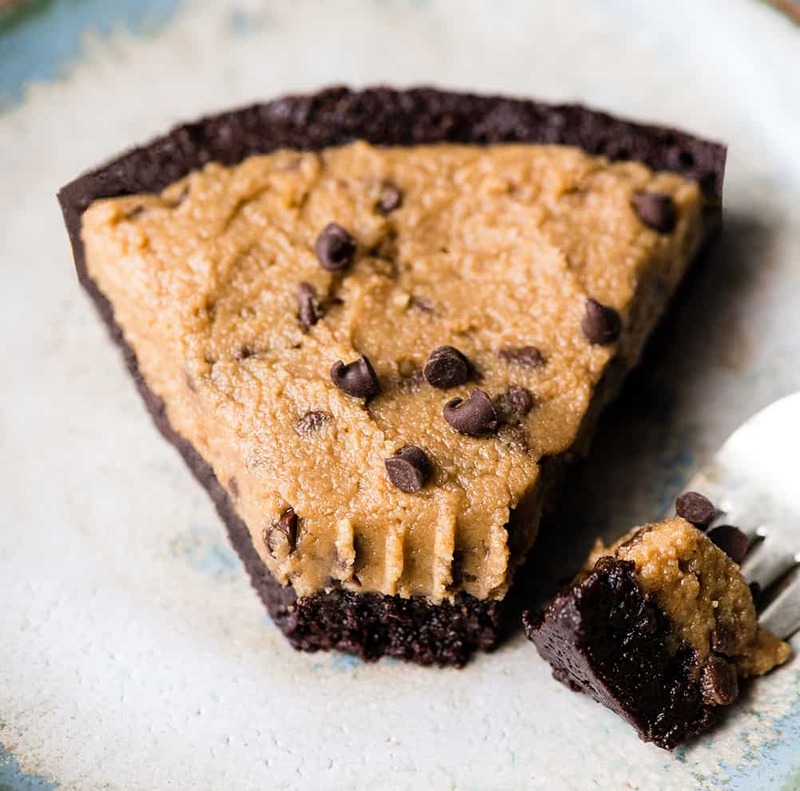 *if you want to keep this recipe refined sugar free, use unsweetened chocolate instead of chocolate chips. However you may need to increase the coconut sugar. **any granulated sugar works perfectly in this recipe! 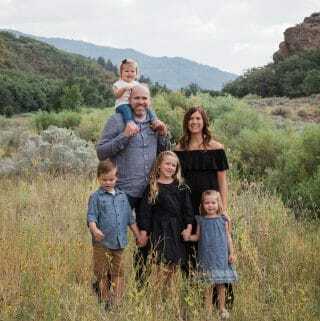 Happy Birthday to my daughter and blogger extreme! Hope today is a wonderful day! Happy birthday Laura!!!! I know I am soo late, but this is a gorgeous gorgeous cake. I love all your love for things brownie and peanut butter. You are my go to resources for anything peanut butter and chocolate.